HEIDLEBERG (DE), February 2019 — Stem cells are true "jacks-of-all-trades" of our bodies, as they can turn into the many different cell types of all organs. This allows tissues such as muscle or brain to renew and to heal after injury. This amazing multipotency makes stem cells in the adult body key tools for the future of regenerative medicine. A study by scientists at the German Cancer Research Center (DKFZ) now reveals how brain stem cells make the decision to transform into new nerve cells. Their work is published in Nature. Ana Martin-Villalba, M.D., Ph.D., and her research team at the DFKZ followed stem cells along the path to neurons, analyzing at every step which genes were switched on and which were actually turned into new proteins. They expected to find that stem cells would simply switch their stem cell genes entirely off in order to become a neuron. But things turned out to be much more complicated. Dr. Martin-Villalba and her co-workers found that stem cell genes were not switched off, but simply put on standby by preventing them from making the protein product that keeps the cell multipotent. "To go into this standby mode and thus start the journey to become a neuron, stem cells switch off their inner signal to proliferate (called TOR) and stop to divide," Dr. Martin-Villalba said. Very surprisingly, the researchers also found that stem cells always buy a return ticket. Just as airplanes can travel back and forth between countries, switching TOR on or off allows cells to travel from stem cell to neuron or back. "Thus, the decision of a stem cell to become a neuron remains reversible for some time," said Avni Baser, Ph.D., the scientist leading this project. Normally, the travel of stem cells is in one direction to make nerve cells, unless something goes wrong in between. But if stem cells cannot properly control their TOR signal, they keep going back to stem cells, which in the long run can cause brain cancer rather than healing the brain. Indeed, in many cancers the level of the TOR signal is artificially high. For future developments of stem cell therapy, understanding and controlling TOR activity in stem cells will be very important. TOR activity (red) in the brain of a mouse. 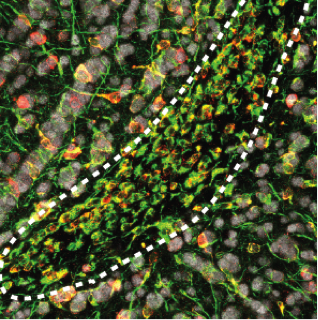 The newly generated immature nerve cells (neuroblasts) are shown in green. The dotted line shows the "bulbus olfactorius," a part of the brain into which the immature nerve cells migrate. Image courtesy of © Ana Martin-Villalba/DKFZ.